Egg pasta stuffed with spinach, ricotta and roasted tomatoes, topped with our rich béchamel sauce. Remove the film but leave the cannelloni in their wooden tray*. Place on a baking tray in the centre of the oven and cook for 30 minutes. If using a gas oven, cook for an extra 5 minutes. Semi-skimmed milk, tomatoes, egg pasta (12%) (durum wheat semolina, water, pasteurised free-range egg), cream (milk), Spinach (9%), Cheddar cheese (milk), ricotta cheese (milk) (7%), onions, passata, extra virgin olive oil, fortified wheat flour (wheat flour, calcium carbonate, iron, niacin, thiamin), butter (milk), lemon juice, tomato purée, rapeseed oil, salt, Regato Cheese (milk), semi-dried tomatoes, cornflour, pumpkin seeds, honey, garlic purée, lemon zest, sunflower oil, vegetarian Worcestershire sauce (water, sugar, spirit vinegar, molasses, onion purée, salt, tamarind paste, cloves, ginger purée, garlic paste), sugar, oregano, tomato paste, ground nutmeg, parsley, garlic, ground white pepper, chillies. 2. Drizzle the vinegar and oil over the salad and finish off with a sprinkling of salt and freshly ground black pepper. 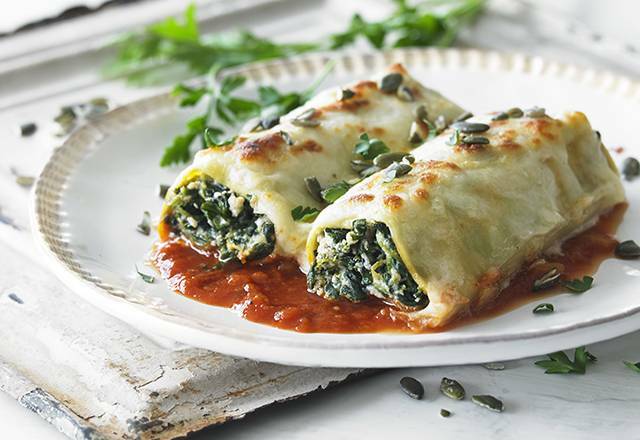 Serve with some warm crusty bread and a freshly baked Charlie Bigham’s Spinach & Ricotta Cannelloni. Like our lasagne, this is a dish that demands to be eaten with a glass of red wine in hand. A medium-bodied merlot or chianti would be ideal.